pwned experiments: Spinning out of control. "So I had grown bacteria in 2.5 L LB in preparation for a maxi prep and needed to centrifuge them down to a pellet so I could begin. I transferred my solution to centrifuge tubes and placed them in the centrifuge. I didn't remember the exact speed necessary to pellet bacteria (which I have since learned is 6000 xg), but I knew the maximum speed of the centrifuge must be above the necessary speed to pellet bacteria (the maximum speed of the centrifuge being 38,400 xg), so I used that speed. I didn't really worry about the bacteria dying under the pressure since I thought things like that only happened to erythrocytes. 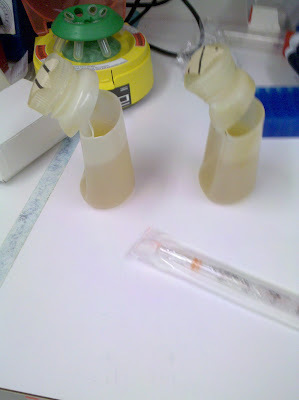 Anyway, when I was finally done centrifuging, I noticed that my centrifuge tubes were deformed and stuck in the rotor. Afraid to ask for help, I picked up the rotor and brought it back to my lab bench and pried the tubes out of the rotor with a 5 mL pipet. 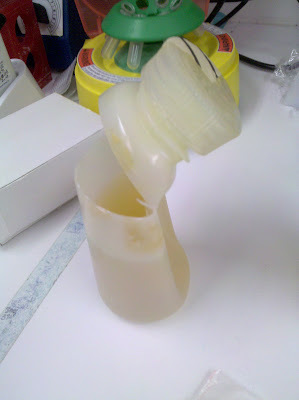 After successfully retrieving my tubes I realized because they were so deformed, I was unable to take off the cap. Refusing to start over and grow another culture, I used a razor blade to cut through the plastic of the tube so I could remove the top portion (I took a picture of the results). After all this to access the bacterial pellet in the tube, my maxi prep ended up yielding low amounts of DNA, thus forcing me to redo it anyways." I can relate to this, although I ruined the centrifuge tubes by running an acetone mix. This was during a course lab with a really passive aggressive lab assistant, so I just threw them away discretely. Experiment worked though. That reminds me of a maxiprep i did with my team this fall, where the glass container (stupid choice on our part) broke in the centrifuge and we ended up fishing the whole thing out complete with glassshards and purifying DNA from that. Ironically it was one of the most succesful runs we did. 2.5L !? That's one hell of a maxiprep. During my undergrad research project, I had to purify intestinal ALP from rat intestinal brush borders extracts through centrifugation at 75k RPM (IIRC).